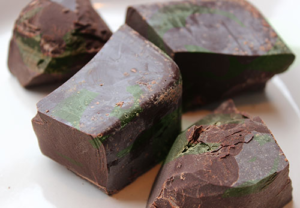 The Best Chocolate is a Superfood too. Natural, Organic, Raw and Delicious. This Raw Chocolate is perfect to impress your guests at parties and they won’t believe it’s raw. The Chocolate Revolution is here! No more cooking and a lot more health from superfoods! Step 1 is to warm up the Coconut butter by placing in a pot of hot water on the stove until the water starts to boil. 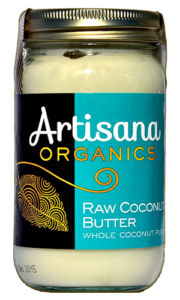 You will know when the coconut butter is ready when it becomes very runny. Pour it into a large wooden mixing bowl. Mix the coconut butter, cacao powder, mesquite powder, and maca into a bowl. add the raw honey as you mix and keep adding the honey until it’s easy to swirl. Mix until all the white coconut particles dissipate. You can use the Artisana jar to put the chocolate into for storing and immediately place in the fridge for 1 hour. Or…shape the chocolate, however, you choose using containers of the shape of your choosing. Place into the fridge for at least 1 hour and it will harden. Then serve!